With the company motto "a life in vintage", we aspire to keep the treasures of yesterday alive in an updated and stylish fashion. Each piece of Findings Jewelry is handmade in our New Jersey based studio and utilizes a wide range of vintage components. From keys, brooches, coins, pearls, buttons, and chain everything we create is one of a kind in its own right. This is our biggest statement necklace. This style offers a range of color and the most variety in vintage pendants. This style bracelet is the design that started the whole line. 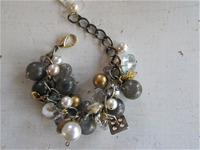 It features vintage beads and an assortment of vintage charms. We offer a variety of colors in this style bracelet. 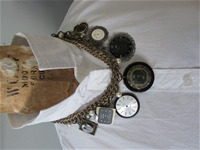 In this style of necklace we use watch faces in each. 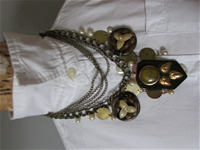 Each individual necklace uses a color theme, for example, all black, neutral, color to make each necklace look uniform. The band of each of these bracelets is a vintage ladies stretch watchband. 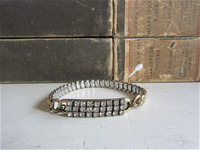 The statement element of this design is made from broken vintage rhinestone bracelets. 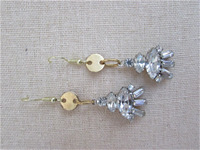 Every pair of our earrings uses a varity of vintage components, from vintage chain, to rhinestone pieces. 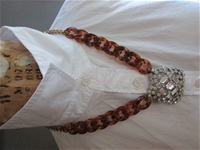 The concept of this necklace always remains, brown tortoise chain with a vintage rhinestone pendant. The pendants on this style are what makes each piece unique.